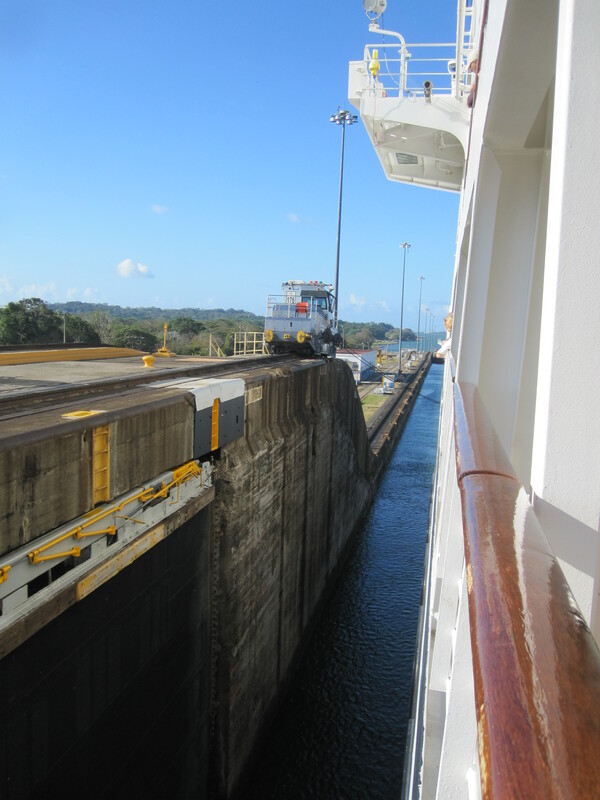 Our recent cruise was my second passage through the Panama Canal but a first time for my husband. As you may remember from my enthusiastic account of the Danube-Main-Rhine canal a year ago, canals and locks really fascinate me so it was a treat to see more locks in action. The canal is 100 years old now. 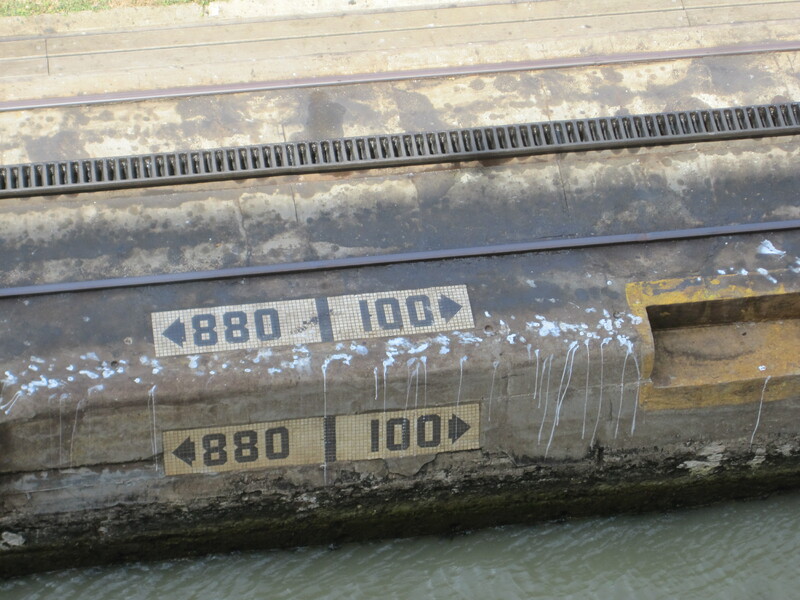 Inaugurated in 1914 (during the week which began World War I) the canal has some “vintage” looking parts indeed. But all the essential parts are still working just as they did at the opening. The hand-off from US to Panamanian control in 1999 came off with no discernible difference in operations. And now construction is well underway on the long-discussed third set of locks – but more on that next week. 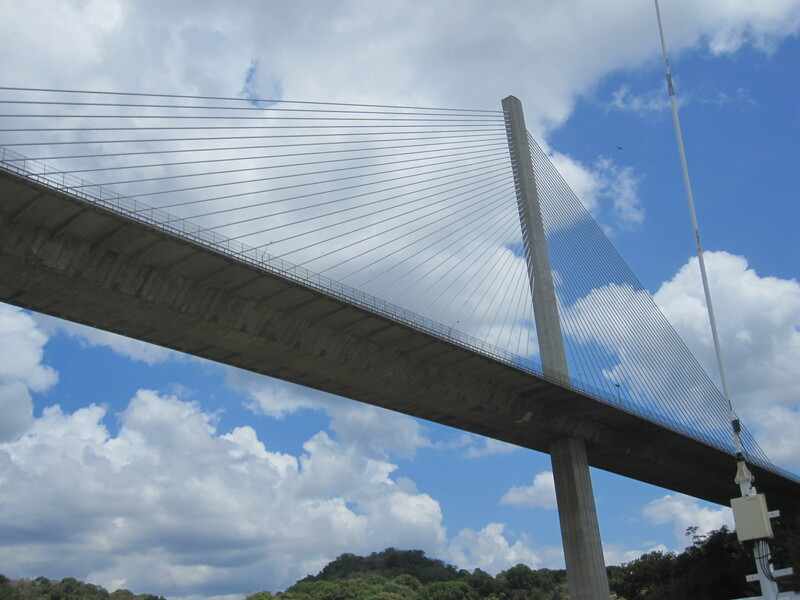 Sailing from Pacific to Atlantic we first pass under the Bridge of the Americas (part of the Pan-American Highway). The excitement begins (assuming your threshold for excitement is as low as mine) a few miles later at Miraflores Locks. Here ships line up to enter from sea level and be raised in the lock to the next level by water which originated at Gatun Lake in the center of the isthmus. Diesel electric “mule engines” attach ropes to port and starboard sides, fore and aft, of each ship entering the canal. The ships pass through the canals under their own power. Mule engines’ ropes act only to nudge the ship left or right to keep it away from the sides of the lock. I wondered if there had once been live mules where the engines are now (considering the 1914 completion date). No. It has always been engines, originally powered by steam. These were probably more predictable and cooperative than live mules anyway, and not subject to fatigue or disease. As the ships move forward in an uplifting lock, the engines ascend their cog rails to the new level. With the engines holding steady, front and back, water is released into the lock from the higher level, raising the ship to the higher level so now we are looking down on engines and buildings which used to be near eye level. No pumps are used; gravity moves the water. The swinging gates at each end of the lock meet in a V with the apex toward the higher water; the weight of water forces them to stay closed, at least until the levels are equal. Simple and elegant! 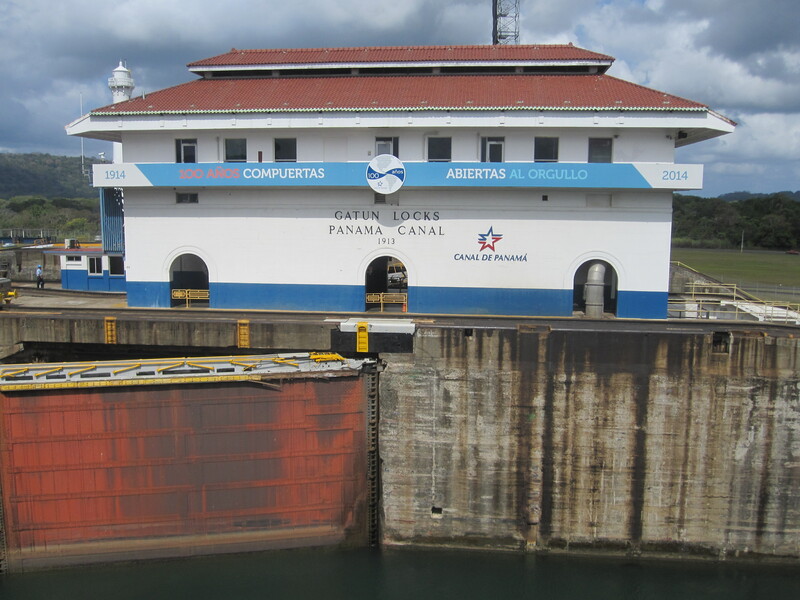 After Miraflores Locks we proceed to Pedro Miguel Locks, then unescorted into the Culebra Cut. This excavation through the continental divide of the isthmus was one of several very challenging parts of the original construction. 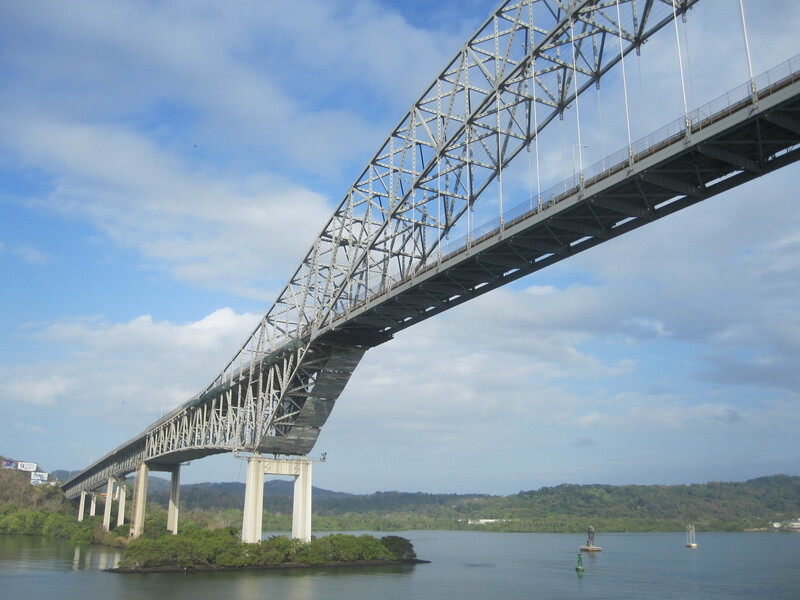 It is this passage which acts as the “at grade” thruway, 85 feet above sea level, from the Pacific side locks to Gatun Lake which provides water for locks going to both seas. A leisurely sail through Gatun Lake brings us and many other ships to Gatun Locks where we again wait our turn to pass through the gates. Arriving at sea level 8 hours after the start, we are now in the Caribbean. It could be clear sailing all the way to Europe or Africa! 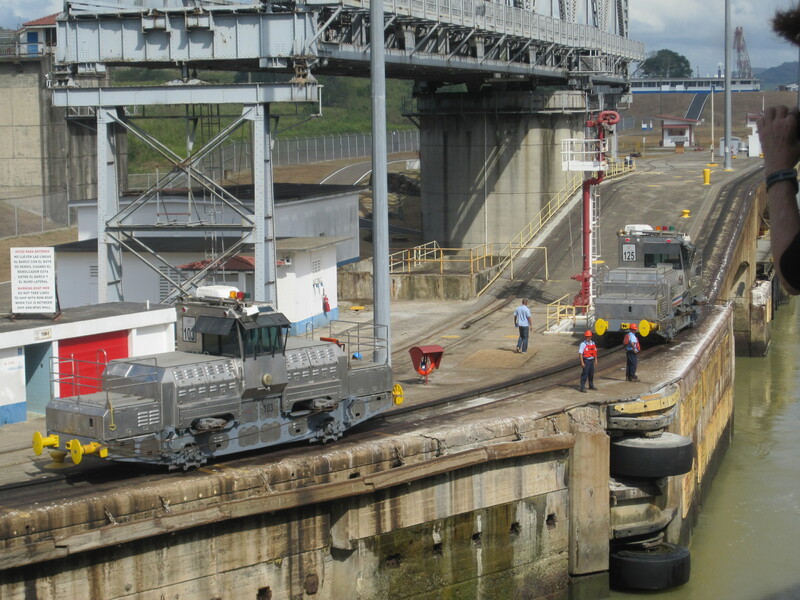 If you are ready to make your own Bucket List transit of the Panama Canal, call me. I would be delighted to send you along this water highway between the seas. This entry was posted in Travel, Uncategorized and tagged Culebra Cut, Gatun Lake, Miraflores Locks, Mule engines, Panama, Panama Canal, travel. Bookmark the permalink.